Not long ago, we seemed to accept the notion that humans only use 10% of their brains, as if the other 90% would remain a mystery forever. Today, not only has that myth been debunked, research on the brain is exploding and giving clarity to our misunderstanding of this untapped human resource. With a generation of baby boomers interested in keeping the aging brain healthy, studies on how our everyday habits influence brain health are popping up on a daily basis. This organ that represents three percent of our bodyweight, but uses 20 percent of our body’s energy, has captured the limelight. The docuseries, Broken Brain, recently aired and featured doctors discussing key research associated with the brain. Some highlights include the importance of the gut-brain connection, how brain health is connected to blood sugar (Alzheimer’s Disease is often referred to as “Type 3 Diabetes”, how thyroid health impacts brain health and how fats, particularly omega-3 essential fatty acids (EFAs), are critical to optimal brain health. Omega-3 EFAs, eicosapentaenoic acid (EPA) and docohexanoic acid (DHA), have always been considered tried and true “brain nutrients”. Even as trendy brain health supplements such as phosphatidylserine, phosphatidylcholine, SAMe and 5-HTP bombard the market, omega-3s are a perennial favorite. People accept that eating the Standard American Diet (SAD), which has decreased our intake of omega-3s (primarily found in oily, cold-water fish), has increased our risk of inflammatory diseases, including debilitating brain function. One key area of interest is traumatic brain injury (TBI), a major cause of death and disability affecting 1.5 million people each year. For years, the anecdotal evidence was there. Famed nutritionist, JJ Virgin, shares the story of how fish oil healed her son’s brain damage, restoring him back to health following a car crash where he suffered skull fractures and bleeding on the brain. Clinical research is now catching up to the anecdotal evidence. One study titled, “Neuroprotection for the warrior” confirms that omega-3s exert a protective mechanism at the cellular and neuronal levels of the brain following TBI. They recommend a daily regimen of omega-3s for everyone, but up to 3 grams for athletes, soldiers or anyone at risk of brain impact. Supplementing with omega-3s prior to injury can also be useful and effective in recovery. In another study, docosahexaenoic acid (DHA) was used to enhance the therapeutic potential of neonatal neural stem cell transplantation when treating TBI, and found that prior treatment with DHA improved the outcome of the transplant. DHA supplementation was also shown to mitigate the effects of TBI in a rat-model study published this past November (2017). With groups separated into TBI-low DHA, TBI-high DHA, and healthy rats assigned to a sham group, motor and cognitive recovery were tested using beam-walking and water maze trials. Results comparing the two groups showed the TBI-high DHA group demonstrated shorter escape latency and swimming distances in the trials, a stronger overall recovery than the TBI-low DHA group. 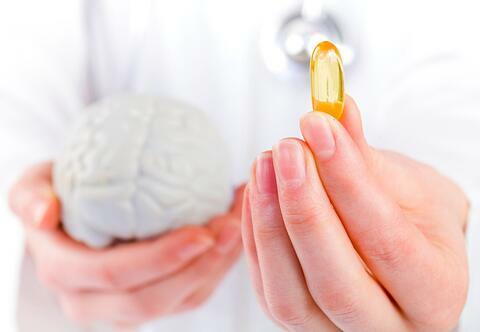 TBI is not the only brain-related health issue being investigated using omega-3s. Recently, studies on Alzheimer’s Disease (AD), ADHD, and anxiety and depression show positive correlation with the use of omega-3s. One study showed that patients with AD have lower levels of a number of nutrients, including a lower brain availability of DHA. Also, EPA and DHA were found to increase the degradation of amyloid-β (Aβ) by affecting the insulin-degrading enzyme, and therefore, increasing Aβ turnover. AD pathology is linked to an overproduction and accumulation of Aβ plaque build-up in the brain, so to influence a key enzyme lessening that plaque accumulation is noteworthy. The ADHD research consistently shows that children and adolescents with ADHD have been found to have deficiencies in omega-3s. Therefore, the evidence is strong that omega-3 supplementation improves clinical symptoms and cognitive performance in these children and adolescents. Chronic stress can also impair learning and memory. “Supplementation with omega-3s improved dendritic architecture, restored the frequency of inhibitory post-synaptic currents of hippocampal pyramidal neurons of rats from stress group and improved spatial memory.” The study concluded that omega-3 supplementation should be considered for stress-related psychiatric disorders such as anxiety and depression. A very recent study linked omega-3 consumption to better sleep and higher IQs, by an average of 4 points, in children. The brain affects everything. This magnificent organ controls body temperature, blood pressure, heart rate and breathing. It helps interpret the vast amounts of information flooding the senses, and commandeers physical movement. The brain also provides the ability to think, reason, dream and have emotions. Given the simple fact that our bodies cannot make EPA and DHA (and the SAD diet cannot provide them), combined with burgeoning research emphasizing that our brains need them, supplementing our diets with a rich and pure source of omega-3s seems like a “no-brainer”.